Pip Wilson bhp: O2 Arena, London Spectacle, experience and expected politicking from the irreplaceable U2. O2 Arena, London Spectacle, experience and expected politicking from the irreplaceable U2. 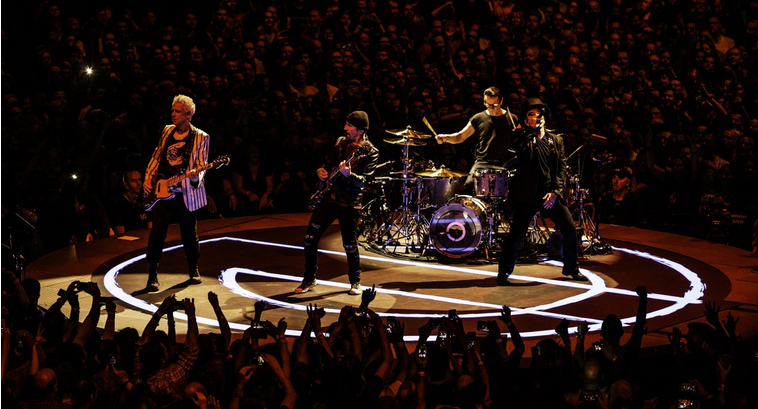 Spectacle, experience and expected politicking from the irreplaceable U2. There’s something special in the air tonight. U2 roll into London with their Innocence + Experience show once more, bringing with them a sense of a band who may be starting to enter their final chapter but still remain fighting fit. One of the few artists in the world who are capable of making The O2 feel intimate, the long runway and multiple stages dominate the entire centre of the arena. Clever touches abound throughout. Hanging from the roof of the arena, a gigantic video screen flashes images and messages before the band appear inside it to ‘The Blackout’, almost seeming to be part of the display initially before emerging fully in lightning fast flashes of light. What then follows is an impressive journey through the years, pulling from nearly all of their albums (with the notable exceptions of, amongst a handful of others, The Joshua Tree and most strangely, Songs Of Innocence - both missing perhaps due to recent celebratory tours in their own right). The concept of the Dubliners moving from days of innocence into experience works well, Bono dropping in anecdotes about the early days. “34 people saw us in 1980 at The Hope & Anchor. Tonight is… better.” he laughs after breakneck renditions of ‘I Will Follow’, ’Gloria’ and ‘Beautiful Day’. As The Edge rips through the mighty riff to ‘The Fly’ (surely one of the strangest number one records of the 1990’s), and the crowd lustily roars along to ‘Who’s Gonna Ride Your Wild Horses’, the first part to the night draws to an end. A clever animation continues the journey into the days of ‘Experience’, a heady time that Bono tonight freely admits could have spelt the end for U2. Re-appearing at the other end of the arena, a volley of huge bangers are delivered - ‘Vertigo’, ‘Elevation’, ‘Even Better Than The Real Thing’ setting the night off once more before the return of MacPhisto, Bono’s twisted alter ego during Zoo TV days. Slightly shonky effects notwithstanding, it is amusing to see his return to the fray. Of course, Bono wouldn’t be Bono without some political point-making. “This is not who we want to be” he shouts at the outset of ‘Pride (In The Name Of Love) - a song that sees the four band members scattered across the huge arena. Giving an impassioned cry for unity, solidarity and a love for London as one of the great European cities, a huge EU flag drops behind the stage. “Without you, we are less” he states simply before a version of ‘New Years Day’ that suddenly seems to take on a whole new context, even before ‘Ode To Joy’ plays as an outro to hammer the point home. There is still time for an encore that contains a highly emotional version of ‘One’, with U2 lit up by the glow of a few thousand phone torchlights, shining like the brightest stars in the night. Much like the night itself, its message of the importance of togetherness and the need to overcome our differences still carries the same power and poignancy that it ever did. Words for both the innocent and the experienced, to live by.